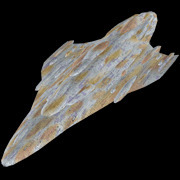 Mon Calamari Star Cruisers were the main cruisers in the Rebel Alliance/New Republic fleet for a significant portion of the Galactic Civil War. They were the first large capital ship available to the Rebel Alliance Fleet, giving it for the first time the ability to face the larger Star Destroyers of the Imperial Navy. The Mon Calamari cruisers were originally built for civilian purposes, serving in numerous peaceful roles like passenger ships and deep space exploration vessels by the Mon Calamari of Dac. Yet, when the Galactic Empire invaded and conquered their home system and enslaved their people, the Mon Calamari converted their ships to capital ships. Admiral Ackbar convinced his people to join the Rebellion. They in turn donated their fleet of cruisers to the Rebel Alliance, while many Mon Calamari joined to serve in the Rebel Fleet.